* No metal parts means rustproof and long life. * Lightweight, long wearing and reusable. * No seams and won't dent. * More cost-effective than metal pails. 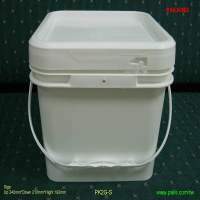 * Empty pail nest for low-cost stacking and shipping. * To aid in recycling, we offer all-plastic pail, handle and flexible pull spout. * Comply with International Transportation codes. * All PAILKING™ pails are manufactured from F.D.A. approved materials.